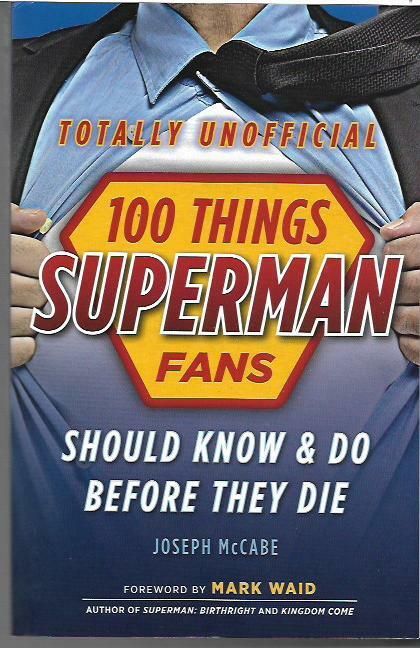 If you’re one of those Superman fans who don’t enjoy the Ayn Rand-infused cinematic tragedies of director Zack Snyder, you may well find Totally Unofficial 100 Things Superman Fans Should Know & Do Before They Die by Joseph McCabe [Triumph Books; $14.95] a welcome relief from Snyder’s inability to grasp the most basic concepts of the super-hero genre. This 300-page-plus softcover takes the reader from Superman creators Jerry Siegel and Joe Shuster to the Batman v Superman: Dawn of Justice movie. Covering over 75 years of super-adventures and behind-the-scenes events would be a challenge even for a man of steel. McCabe does an excellent job covering that territory. There are a few places where he states his opinions as facts, which is always annoying to a grumpy old fan like me, and one case where he seems to be completely ignorant of an individual’s criminality, but he’s able to leap years and decades of Superman history with a hundred breezy chapters, over two dozen interviews with actors, comic-book creators and movie makers, and countless illustrations and photos. Okay, yes, someone could count them, but that someone wouldn’t be me because I would lose count and have to start over and just would never finish this review. There’s also one terrific foreword by my pal Mark Waid, one of my favorite comics writer and one of the four or five writers I would hire to write Superman if I was in charge of the character. A fan can dream. I read 100 Things Superman – What? You expect me to type the entire title again? – over a few weeks. It sat on top of a pile of books I keep on my bedroom night stand. I’d read a dozen pages before I went to sleep and before I would take a nap and sometimes because reading a book I knew I’d review is something I can delude myself into considering not goofing off. Because it wasn’t. I was working. No, really. Stop snickering. I hate you. 100 Things Superman is a swell book. 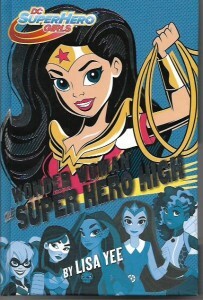 It would make a great gift for the comics reader in your life. It would make a great gift for the new Superman fan who, despite those Zack Snyder movies, loves the character and wants to know more about him. It would make a great gift for you to give yourself. Because you deserve it and because you weren’t snickering a paragraph ago. IDW’s Classic Popeye [$4.99 per issue] is one of the true delights of this true Golden Age of Comics. Readers can enjoy wonderful new comics from all over the world as well as classic and not-quite-so-classic comic books from the past. This title earns its adjective issue after issue. Classic Popeye #44 reprints Popeye #44 [Dell; April-June 1958} with stories and art by Bud Sagendorf. Save for the back cover house ad and two small, bottom-of-the-page house ads, the issue is cover-to-cover entertainment. Two Popeye stories, a short O. G. Wotasnozzle tale, two one-page Popeye gags and a single-page text story. Given that a near-mint condition copy of the original comic could easily sell for a hundred dollars, five bucks seems like a real bargain to Thrifty Tony. In the middle story, Wotasnozzle accompanies his annoyed landlord on a fishing trip. As usual, O.G.’s scientific devices are not yet ready for the marketplace. The second Popeye story has Swee’pea kidnapped by criminals wanting to know where Popeye has buried the vast quantities of pirate gold the one-eyed sailor has found over the years. The so obvious answer had me laughing out loud. 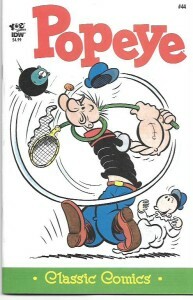 IDW has been reprinting these reprints as Popeye Classics. They’ve published seven hardcover volumes to date with an eighth volume on the schedule for September. These volumes may be difficult to find and even a little pricey, but it’s worth looking for them and also looking for bargains. Arf…these am some swell comical books. Garth Ennis writes war comics that are the equal of all but a few of our history’s very best war comics – Harvey Kurtzman’s EC Comics titles and Archie Goodwin’s Blazing Combat – and superior to most titles in the genre. Currently, he almost has the genre to himself between War Stories (Avatar) and Johnny Red (Titan), my pick of the week for this week. Johnny Red first appeared in Battle, the renowned British weekly of the 1970s. Created by writer Tom Tully and artist Joe Colquhoun, the ongoing serial told of a Royal Air Force cadet who received a dishonorable discharge after hitting a superior officer. He ended up joining and becoming the leader of a Russian fighter squadron. That’s not the entire Johnny Red story, but it’s enough for the purposes of this review. 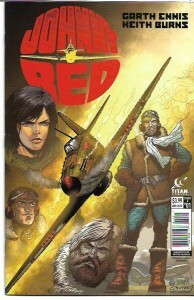 Johnny Red #1 [$3.99] starts with a wealthy collector of warplanes bankrolling the restoration of a Hurricane, a single-seat British fighter plane that could be catapulted from the deck of a ship for what would, unless a pilot could manage to reach a friendly land, almost certainly be its last flight. The restoration craftsmen have done research into the history of this aircraft, which conversation leads us into the dangerous life of our title hero. 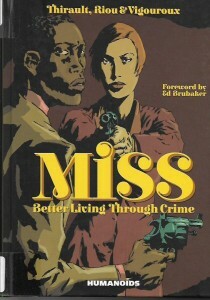 In the six issues published to date, Ennis gives us grim-but-real characters fighting and sometimes surviving in the perilous setting of the Second World War. There are brave men and women facing doom on a daily basis. There is courage and an odd fellowship. There are dastardly Germans and corrupt Russians. It’s a hopeless situation, but the sharp writing and the explosive art draw the reader into it and make you feel like you’re facing the same perils. I can’t say enough good things about the art of Keith Burns. He is a keen storyteller and, when the pages erupt in battle, it’s as if bullets and flaming metal are all around you. I think it’s the most exciting war art since Joe Kubert, Russ Heath and Sam Glanzman were at their best. Were I able to afford original art, I’d bust open my budget to get one of Burns’ magnificent art combat spreads. Wow, this is great stuff. Johnny Red is one of the best comics being published today. Besides all of the above, each issue also features a historical text piece or two. If you’re more inclined to write for a collection, Johnny Red: Collection 1 [$16.99] is due to be released in October of this year. It’d make a great gift for war buffs and war comic book fans alike. It gets my highest recommendation. This week is my first-ever “First Issue Special” review column in which I’ll be taking a look at the first issues of three new comic-book titles. Which one will be my pick of the week? I’ll save that for this week’s big finish. 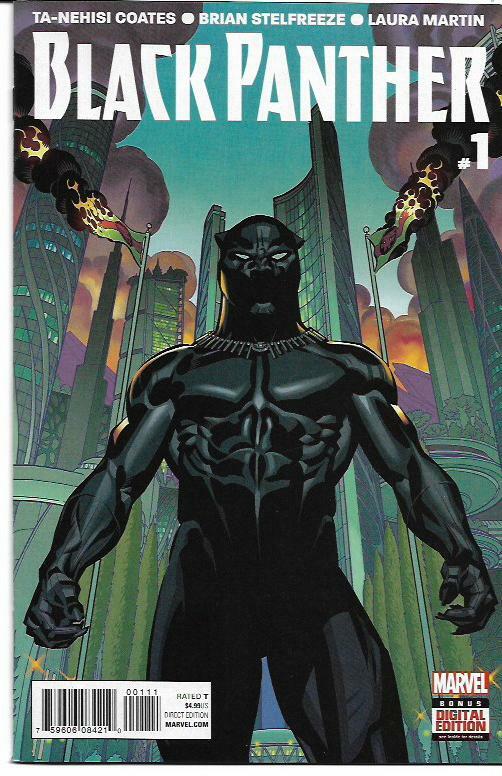 Award-winning author Ta-Nehisi Coates makes his comic-book writing debut in Black Panther #1 [$4.99] and it is a breathtaking journey into the soul of Wakanda. I have expressed my dissatisfaction and even disgust with how the Black Panther and Wakanda have been seen in Marvel comic books. Unconquerable Wakanda has been conquered at least three times in recent years. T’Challa’s innate nobility has been tarnished as inferior comics writers – those who would bring darkness to the most optimistic of comics genres – brought him down to their level. Had I been relaunching the Black Panther, I would have ignored all of that and claimed it all went away when reality was remade in the wake of Secret Wars III. Coates does not do this. Coates jumps into the rodeo and rides all of these untidy elements. He presents a Wakanda divided, but the divisions come as a likely result of the multiple tragedies. While this initial issues is more than a mite short of the Panther action so brilliantly portrayed in the 1970s stories written by Don McGregor, there are political and spiritual conflicts that intrigue me. I do still want to see of the “people punching other people” that Coates himself lists as one of the key elements of a good super-hero comic book, but this issue is a good start. The issue’s visuals are as wonderful as the writing. Artist Brian Stelfreeze brings a thoughtful design sense to every aspect of the Wakandan backdrops and costuming, drawing heavily on the “African mentality” of the script and settings. His storytelling is likewise excellent. Color artist Laura Martin enhances the art. This issue is a class act all the way: a terrific story and bonus pages on the development and aspirations of the series. Editorial earns points with a “what has gone before” opening page that sets the stage for this and future issues. I only buy a handful of Marvel Comics titles. Black Panther is and will remain among them as long as subsequent issues are as terrific as this premiere effort. I’m not sure comics creator Ryan Ottley knows who I am or anything about me. 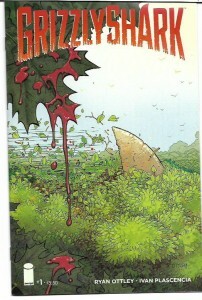 However, if he did know anything about me, he would have known it’s not in me to resist buying a comic book called Grizzly Shark [Image; $3.50]. Outside of my wife and kids and a few of my friends, comics are my first love. My second love is cheesy monster movies. I am the guy who will watch Dinoshark and Mega-Shark Versus Giant Porcupine and every other darn movie of that sort. The cheese is strong within me. Grizzly Shark is about a shark who has somehow ended up in a forest and is now chowing down on anyone who crosses his path. Though we rarely see the entire shark – I suppose Ottley’s budget for special effects was limited – we do see the critter munch on a whole bunch of folks in gory and hilarious ways. Colorist Ivan Plascencia uses a lot of red in this comic book. This is a goofy comic book. I love it. I will be back for the next issue and as many more issues as Ottley wants to make. It’s like he can see into my very soul. 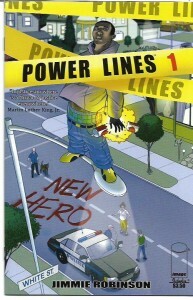 Jimmie Robinson’s Power Lines [Image; $3.99] likewise speaks to me, albeit in a far more serious manner. It’s a tale of ancient power returning to our divisive world and one that doesn’t shy away from the barriers preventing our unity. When we meet Derrick – his street name is D-Trick – he and his pals are heading to an affluent, mostly white California suburb to tag the buildings there. Their graffiti is their art and they believe creating it in this place will insure their fame. However, Tight, the leader of the crew, is there to smash and grab whatever he can. He shatters a car window and steals the purse inside the vehicle. Derrick is spotted by the local police before he can tag anything. He runs from them when. They corner him…and that’s when strange things happen. Derrick feels the power around him and he flies away from the cops. He has no idea what just happened. When we meet Sarah Bellingham, the 48-year-old widow whose car was broken into, she appears to be a stone racist. Yet she’s also been touched by the power, something Derrick recognizes when Saran and her ex-solider son come looking for her stolen phone. Later events bring Derrick and Sarah into contact again and we get to see her in a different light. This comic has heroes and villains sans costumes. It has mystery. It has great characters. It has surprises and, at the end of issue #2, a truly “gotta see what happens next” cliffhanger. I’m hooked. Power Lines is a one-man show. Robinson created the series, writes it, draws it, colors it and letters it. I envy his multiple talents and I recommend this series to anyone who likes super-heroes with a different attitude. My pick of the week was a tough call, but the honor goes to Power Lines. I hope T’Challa and Grizzly Shark will be good sports about my choice. My pick of the week is Al Plastino: Last Superman Standing by Eddy Zeno [TwoMorrows; $17.95]. 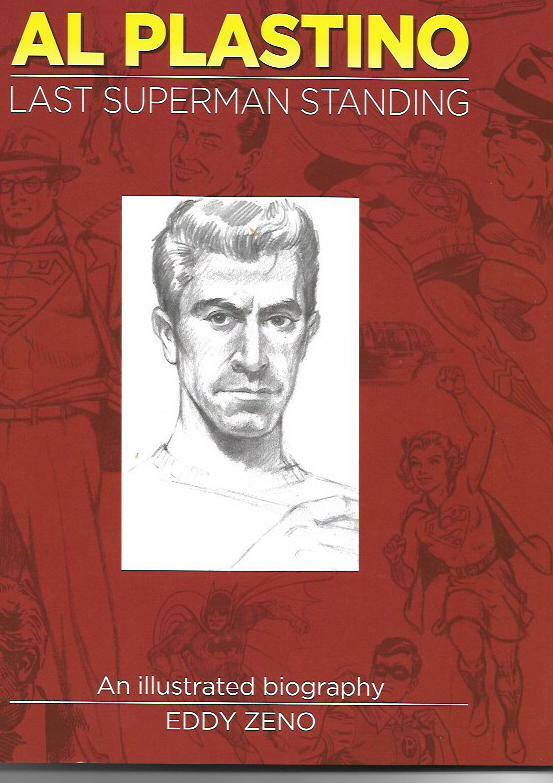 It’s an “illustrated biography” of the artist who, along with Wayne Boring and Curt Swan, defined the Man of Steel for readers of the 1950s and 1960s. Something I hear frequently from comics fans, and I do not except myself here, is that they didn’t appreciate this or that artist as a kid. Plastino was one of those for me. Boring’s work on Superman was dark in its depictions of the mundane and hauntingly wondrous in its depictions of the character’s sci-fi elements. Swan drew a Superman that was our smiling friend and utterly graceful when he uses his powers. Plastino was the middle artist. Yet, when I look at Plastino’s work these days, I see an uncanny mastery of emotion and storytelling that equals the work of the other classic Superman artists of the era. Zeno is a treasure among comics historians. He loves his subjects and, in the case of Plastino, counted him as a friend. Many of his conversations with the artist, conversations which form the heart and soul of this book, happened within a short time of Plastino’s 2015 death. There is a remarkable immediacy to this book, a sense for the reader that they have also gotten a chance to know the man behind the art. Zeno covers Plastino’s life and career in fascinating detail that, despite said detail, made me yearn for more. More examples of the man’s art, more insights from the solid professional that Plastino was, more lessons on the craft and work ethic his subject brought to his comics and other work. Without hesitation, I will tell you the smartest lesson Plastino has to impart to all who follow him, is to have multiple clients. It’s a practice I have adopted in the past decade of my life and it has served me well. From the formative years of the artist to his fight to see his art for “Superman’s Mission for President Kennedy” placed in its proper and intended home, Al Plastino: Last Superman Standing is clearly the definitive work on this great comics creator. All I could ask for beyond this is a collection of Plastino’s best Superman tales. It would be a fitting companion volume to Zeno’s award-deserving book and an equally deserved honor for Plastino. 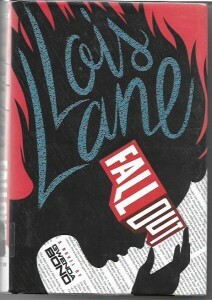 From acclaimed author Gwenda Bond comes a contemporary reimagining of teenage Lois Lane. She’s an Army brat who’s moved more times than she can count with her father General Sam Lane. But now they’re in Metropolis for good, and Lois is determined to fly straight. Stay quiet. Fit it. Maybe make a friend. As soon as she walks into her new high school, though, she can see it won’t be that easy. A group known as the Warheads is making life miserable for another girl at school. They’re messing with her mind, somehow, via the high-tech immersive video game they all play. Not cool. Armed with her wit and her snazzy new job as a reporter, Lois has her sights set on solving this mystery. But even she needs help sometimes. Thank goodness for her maybe-more-than-a-friend, a guy she knows only his screen name: SmallvilleGuy. Young adult readers will relate to the bullying, the loneliness and the people in positions who do nothing about either. As a parent, I can relate to all of that, though the biggest bullies with whom I had to deal during my own children’s time in school were abusive teachers and an unconcerned principal. What Lois and her new pals go through really hit home for me. There are many great elements in this book. There’s an X-Files vibe that is just barely science fiction. There’s a great take on Perry White, editor of The Daily Planet. There are intriguing scenes with General Lane that make you wonder what kind of father and what kind of man he really is. Me, I don’t like him. Also wonderful are the online interactions between young Lois and her unseen SmallvilleGuy. His name is never mentioned, but readers will really get the sense of who this young man is and who he is destined to become. Is there an Eisner Awards category for novels based on comic books? There should be. Because this book deserved to be nominated in that category. Bond’s Lois Lane: Double Down [also $16.95] is the second book in this series and was published this month. I plan on ordering it as soon as I finish writing this column. Zombie outbreaks are not usually my thing, but when the good people at Dark Horse Comics sent me I am a Hero Omnibus Volume 1 by Kendo Hanazawa [$19.95], I figured I’d read a chapter or three to see if it had something more than the typical zombie outbreak comic book or movie. It did. 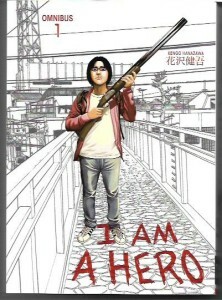 The lead character of I am a Hero is an unsuccessful manga artist working as one of a small army of assistants to a very successful creator. Hideo Suzuki’s one series crashed and burned after a short run. Now he’s 35 years old with no self-esteem to speak of. “I am a hero” is the mantra he chants to himself. His job is exhausting. His life is one of unrealized dreams, unfulfilling relationships and unending frustration. The build to the “zombie outbreak” is brilliantly quiet and slow. The horror lurks in the background: news stories and shadows in the streets. When it explodes into Suzuki’s life, the fearful action is swift and unrelenting. A “hero” woefully unequipped for survival is forced into a fight and a flight for survival. Fans of zombie tales will find the requisite gore and gotcha moments in this manga, but it’s the character of Suzuki that has me hooked and eager for the next volume in the series. When I select my “pick of the week” each week, it’s generally the comic book, graphic novel, collection or other publication that I enjoyed the most. It’s a little more complicated this time around. I can’t say I enjoyed my choice more than the other things I’ll be writing about in this column, but I do believe this week’s winner is one of the most significant comics collections ever published, and that it’s coming at the right time in comics history. 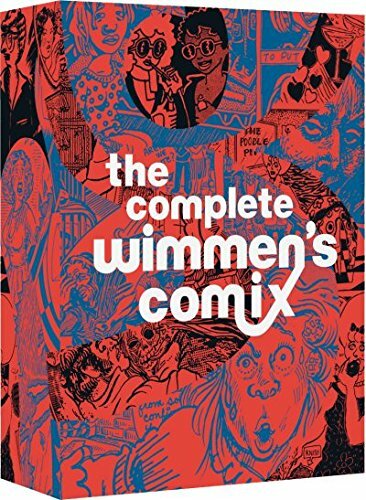 The Complete Wimmen’s Comix [Fantagraphics; $100] is a two-volume reprinting of the underground/alternative comics anthology that was both part of a movement that changed the way many of us looked at the comics art form and a precursor of the current comics era that may be most notable for its greater inclusion of female writers and artists. When I see how many of my favorite modern comic books and graphic novels are by women, it makes this collection all the more indispensable to comics historians and readers. I started buying underground comix when I moved out of my parents’ house in the early 1970s. I was working for a local newspaper and lived a short walk from a “head shop” that sold drug paraphernalia, counter culture magazines and underground comix. That I only bought the comix – and I bought them by the fistful – made the shopkeeper nervous at first, but, once he realized I was a comics afficionado, he relaxed. What he never understood was how I could read all kinds of comics from Archie and The Avengers to The Fabulous Furry Freak Brothers and Wimmen’s Comix. As with the alternative comics works of today, I found underground comics to be a mixed bag. Then as now, I found artsy-fartsy comics pretentious and uninteresting. I still struggle with and despise lettering that makes reading this works more difficult. While I did not and do not mind a bit of naval-gazing from the comics creators who work this side of the comics street – the personal comics are often the best – sometimes it’s as self-indulgent as any “reality” show featuring the Kardashians. Wimmen’s Comix was and is no different. 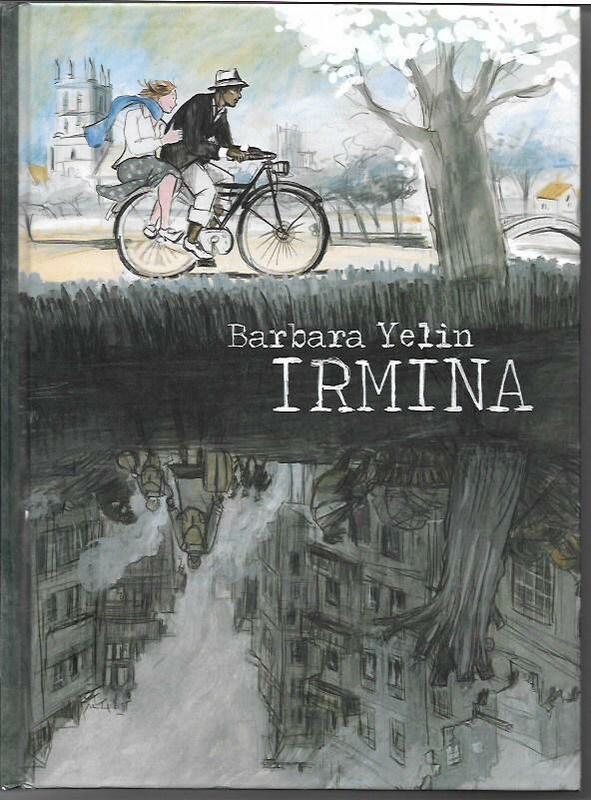 Born in a era when, season of love and tolerance or not, women cartoonists were not usually respected by their male counterparts, the stories in these volumes are sometimes more anger then craft and more political statements than insights. But, as with the other comics and graphic novels I love, there are so many diamonds in the rough. These volumes reprint the pivotal It Ain’t Me Babe Comix and all 17 issues of Wimmen’s Comics, over 700 pages of art and story plus an informative introduction by Trina Robbins, long a favorite comics creator of mine and also one of our most groundbreaking historians. Over 100 cartoonists contributed to these comix/comics and it’s as stellar a line-up as there ever was: Alison Bechdel, Joyce Farmer, Shary Flenniken, Phoebe Gloeckner, Roberta Gregory, Joan Hilty, Carol Lay, Lee Marrs, Cynthia Martin, Barb Rausch, Dori Seda, Mark Skrenes, Carol Tyler and so many more. If I had to pick a favorite issue, it might be Wimmen’s Comix #6, which was a “bicentennial” issue with entertaining looks at history and herstory. But that favorite pick would probably change the next time I flipped through these volumes. Though the reading gets tough at times, the great stuff in these books makes the effort totally worthwhile. If you want to know how we got here, you have to look back at where we were. 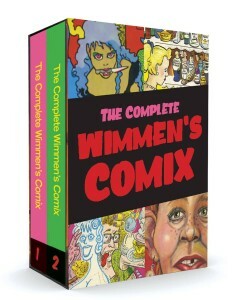 That’s why I believe The Complete Wimmen’s Comix is an indispensable part of your comics library. 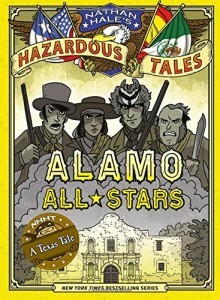 Nathan Hale’s Hazardous Tales: Alamo All-Stars [Abrams; $12.95] is the sixth book in the wonderful series of graphic novel histories from the New York Times bestselling and award-winning author. Hale is a master of presenting the facts, grim as they often are, in an entertaining and even humorous fashion. The books are suitable for readers as young as eight, but can be enjoyed by adults as well, be they comics fans or history buffs. The starting point of the books in this series is Nathan Hale, the hero of the American Revolution, facing his death by hanging. But, taking his cue from Scheherazade, the legendary storyteller of One Thousand and One Nights, Hale delays his demise by telling tales of American history to his executioners, including events taking place long after his death. After the initial jolt, this seems perfectly reasonable. Then again, I believe a man can fly. In this book’s 120 meticulously-researched pages, Hale covers the events leading up to the battle of the Alamo and the key players in those events. It’s the story of Texas, the story of bad things done by men whose history we cleansed to fit modern myths – for example, Jim Bowie was a smuggler dealing in illegal slaves – and the story of how much we lose when we take shortcuts with history. Forgotten is the Goliad Massacre in which 350 men were slaughtered by Santa Ana’s army. Alamo All-Stars is dense in facts and observations, presenting them in a downright breezy manner. The entire Hazardous Tales series is, to my mind, a must-have for school and public libraries. Nor would these books be out of place in the personal library of comics fans who embrace true variety in their collections. 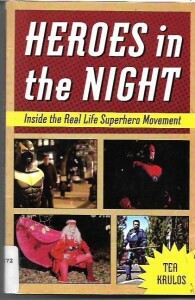 It came out in 2013, but I only recently discovered and read Heroes in the Night: Inside the Real Life Superhero Movement by Tea Krulos [Chicago Review Press; $16.95]. From time to time, you’ve probably seen TV news reports on the seemingly random citizens who don their homemade, sometimes very sophisticate costumes to fight crime and help their fellow citizens. As Krulos reveals, while the former is not always successful or wise, the latter can have benefits to the communities in which these heroes operated. Krulos takes his costumed subjects seriously. He doesn’t hold back when examining when heroes are out of their depth of acting in the name of personal glory. But he also applauds their good deeds and their overwhelmingly good hearts. If you don’t tear up a little on reading the segment of the book on Power Boy, a nine-year-old kid facing an incurable disease and the story of his virtual adoption by real-life super-heroes from across the country, then you don’t get super-heroes and super-hero fiction at all. On the flip side, if you’re at all sane, you must be at least a bit concerned about the number of these real-life costumed heroes who cite Rorschach as their inspiration. Shudder. Heroes in the Night is a fascinating book. I wouldn’t recommend you use it as a super-hero handbook, but it may inspire you to question what you can do to be a hero in your everyday life.